Bulgarika is a group of four master musicians with decades of performing experience. They are all steeped in Bulgarian music and rhythms from a young age. In their performances they draw on formal and informal training, as well as their experience as teachers. The band maintains extensive contact with other Balkan natives, from the Black Sea to the Adriatic, and bring for your enjoyment the very best of the Bulgarian folk-music tradition. Donka Koleva (vocals), an internationally prominent singer, is a native of the town of Rudozemin in the Rodope region of Thrace. She graduated from the National School of Folk Arts in Shiroka Luka, Bulgaria, and performed for three years with Sliven Folk Dance and Music Ensemble. 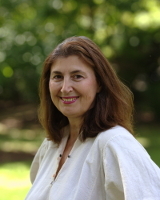 She started her singing career with the band Kabilé in 1982 and in 1986 became Director of the Folk Song Chorus of Sopot. Since then she has been a featured soloist on Bulgarian national radio and television, has participated in numerous singing competitions in Bulgaria and Europe and has been featured on multiple recordings. In 1997 her recording of "Javore" was named Song of the Year in the Bulgarian national competition. Since immigrating to the U.S. she has taught and performed widely across N. America and Canada, both privately and at camps, festivals and other events. In 2005 Donka contributed to the soundtrack for the film "Everything is Illuminated". In addition to her vocal talents Donka serves as Bulgarika's manager and has organized 14 national tours for the bands Kabilé, Bulgarika and for the Kolev Family Ensemble. Nikolay Kolev (gadulka), a native of the Thracian Rose Valley village of Karavelovo, has been playing gadulka since age 10. After graduating from the National School of Folk Arts in Shiroka Luka, Bulgaria, he performed for three years with the Sliven Folk Dance and Music Ensemble. In 1984 he founded the orchestra "Sopot", in 1985 the wedding-music ensemble "Rozova Dolina" and in 1992 the prize-winning ensemble "Balkanski Glasove". In 1994 and 1995 the latter group took first prizes at the Varna Festival. Nikolay has accompanied many well-known singers including Vulkana Stojanova, Roumen Rodopski and Todor Kozhuharov. He has also taught many students at a number of Balkan camps in the U.S. In 1999, Nikolay was the first Bulgarian to be recognized by the Slavic Heritage Council of America for his outstanding contributions to music. 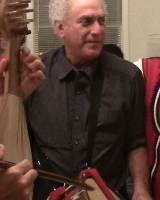 Stoyan Kostov (vocals, tambura), has been playing the Bulgarian tambura for over 40 years. He graduated from the National Music School "Filip Koutev" and the Bulgarian National Conservatory. Stoyan performed with Ensemble Trakiya and played tambura with Harmanliska Troika, and guitar with the Ograzhden ensemble in Sandanski, where he also directed the "N. Vaptsarov" Folk Ensemble. 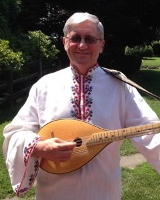 Stoyan lives in Pittsburgh PA.
Michael Ginsburg (tupan) began teaching Balkan folk-dance in 1964 in New York City and now teaches a weekly dance class there. 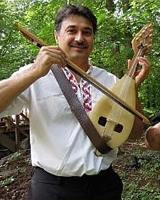 He plays tapan with Cherven Traktor, a band that plays Bulgarian folk music on traditional instruments. He also plays trumpet with Kavala Brass Band, a band specializing in the Brass music of Aegean Macedonia. He is a founding member and lead trumpeter of Zlatne Uste Balkan Brass Band, formed in 1983. In 1987 they were the first foreign band to appear at the world-famous Brass Band festival in Guca, Serbia. Michael additionally serves as the head of the Program Committee of the Golden Festival in Brooklyn, New York, an annual event attracting thousands of participants and featuring dozens of musical groups.